A rent increase letter notifies tenants of an upcoming increase in rent. Typically, there is no limit on how much you can increase the rent if the property isn’t rent controlled. However, you should adhere to your lease and state landlord tenant laws. Generally, a tenant is given 60 days’ notice of the rent increase. If you’re a busy landlord or property manager and need help with templates, tracking your rent or scheduling maintenance requests and much more, contact Avail. 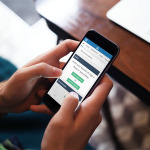 They’re a reputable property management software that is free for your first unit. You need to follow your state laws and adhere to your lease when increasing your tenant’s rent to avoid breaking any landlord tenant laws. A sample rent increase template will help ensure you’re on the right track. You can use it as a guideline for your rent increase notice. It should be worded kindly so you don’t offend the tenant, and it also needs to include all of the information pertaining to the amount of the rent increase and when it will take effect. 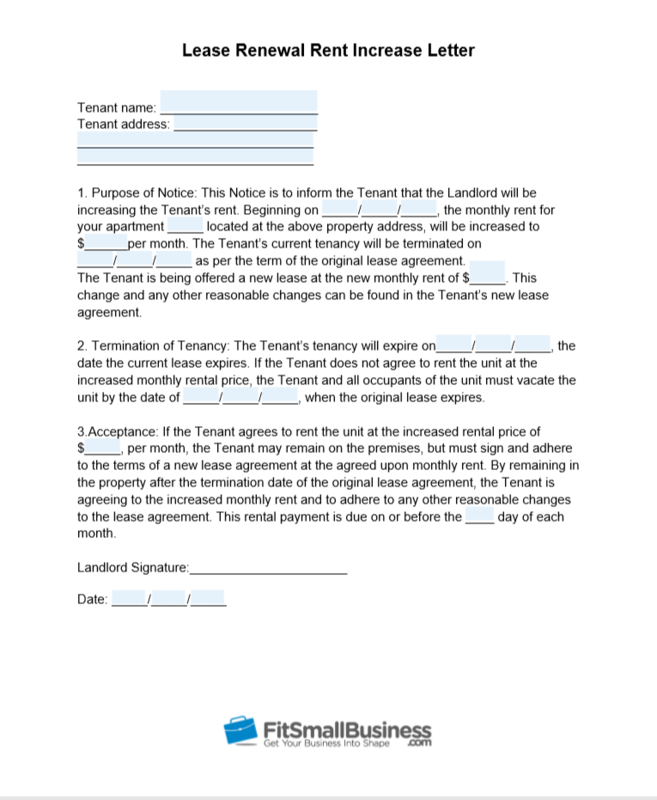 Download the free rent increase letter .pdf that best fits your tenancy. We have four templates for different scenarios including an annual lease, lease renewal, mid-month rent increase, and month-to-month rent increase notice. The templates show you what to include in your rent increase notice. A rent increase letter is sent by a landlord, property manager or agent to a tenant to notify him/her of an upcoming increase in their rent. Generally, the rent increase notice should be sent via certified mail so it can be tracked, and you can always follow up with an email, depending on the style of communication you and your tenant use. The purpose of a rent increase letter is to notify the tenant of the amount of the rent increase and when it will take effect. It should follow any guidelines pertaining to rent increases included in your lease. It should also comply with all landlord tenant laws in your state. We will go into more detail below about what exactly a rent increase letter should include, but remember to choose your words wisely. You want the rent increase letter to be professional, clear, concise, and not offend the tenant. 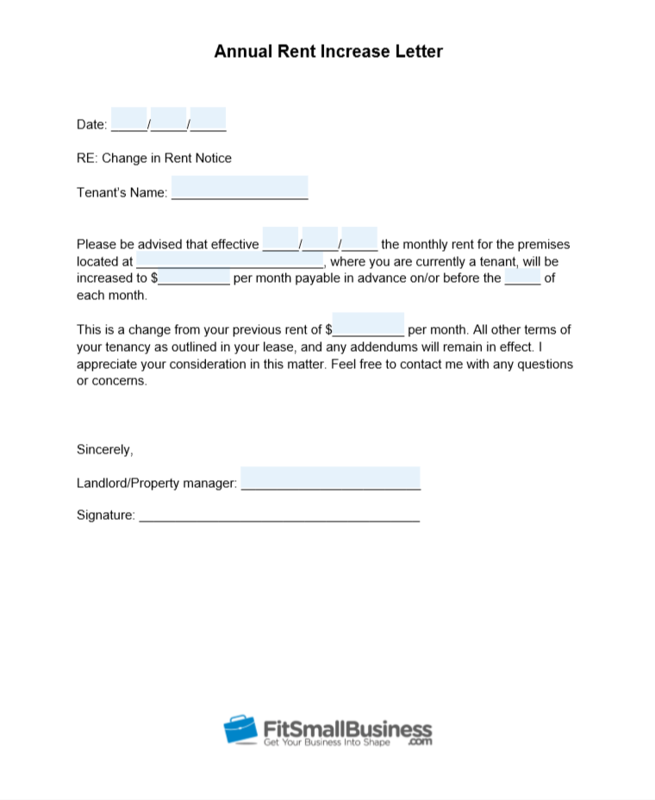 You can play with the wording of our sample rent increase letter to make it better suit your tenant. A rent increase notice is used by both landlords and property managers to provide formal notice of an increase in rent to a tenant. It’s generally required by landlord tenant laws that you must give a certain amount of notice to increase the rent, typically 60 days. 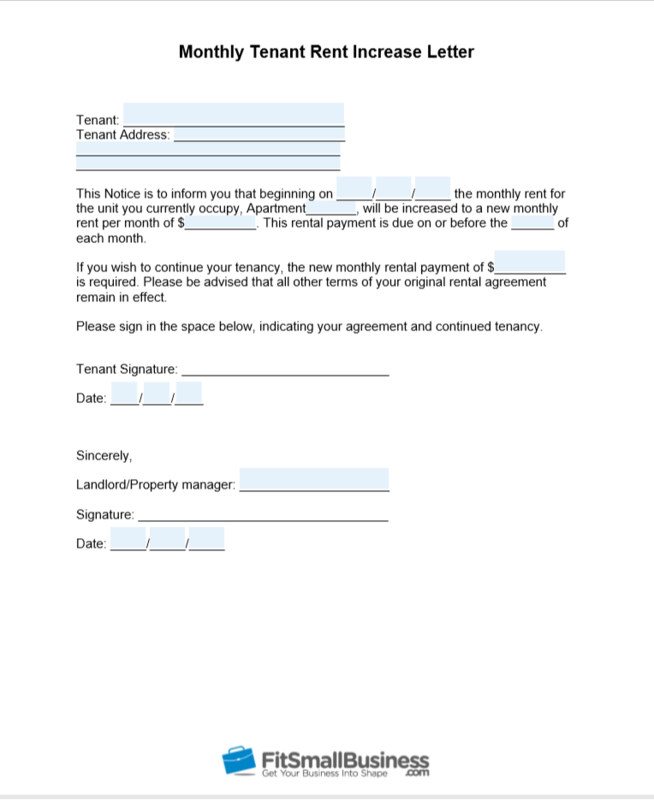 The rent increase letter is used to make the tenant aware of the upcoming rent increase. A rent increase letter is right for both month-to-month tenants and yearly or multi-year tenants. However, different types of leases generally require different amounts of notice. For example, an annual or multi-year lease generally requires a 60-day notice of a rent increase, and a month-to-month notice generally requires a 30-day rent increase letter. Generally, you use a rent increase letter during four different times: at the end of an annual lease, prior to a lease renewal, during the middle of a lease, and at the end of a month-to-month lease. You can only legally increase the rent during the middle of the tenancy if a clause exists in your lease that allows for it. However, it’s much more common to increase the rent when the lease is set to end or renew. Let’s assume that your lease is set to renew in 60 days and there’s a clause in the lease that says you can increase the rent upon renewal. The clause in the lease will say how much notice you need to give the tenant, and it may also include how much you can increase the rent by. 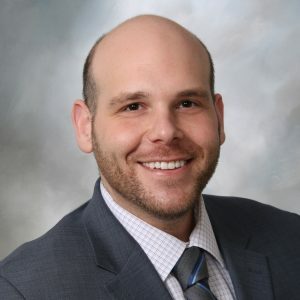 If the current tenant is paying $3,000 per month in rent and the lease outlines that a 5 percent increase in rent can be applied upon lease renewal, the tenant would have to agree to the new rental amount of $3,150 or opt not to renew the lease. The tenant would sign the lease renewal, which indicates the new lease amount and when it goes into effect. Generally, if the rent increase notice gives 60 days’ notice, then the rent increase will take place when the next rent payment is due. For example, if the rent increase letter is written on June 1, 2018, it gives 60 days’ notice, which means the rent increase will take place on July 31, 2018. The rent is generally due on the first of the month with a few days’ grace period, so the rent increase will actually take place around August 1, 2018. If there isn’t a rent increase clause in your lease and it isn’t a renewable lease, then the lease will have an ending date. This means that there is no rent increase letter required. Instead, if you and the tenant agree that the tenant may continue with his/her tenancy, you will create a new lease and can increase the rent with no notice. This is basically just a new lease with the same tenant and therefore the rent can be any amount you both agree upon. 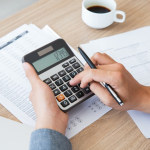 Landlords generally send a rent increase notice to increase the ROI on their property, to cover more of their carrying costs, or because their property-related costs have increased. 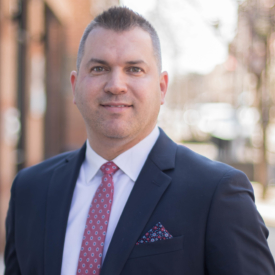 However, there are some unique reasons to increase the rent, which include negotiating a lease renewal, changing the lease renewal date, and encouraging a tenant not to renew the lease. You can generally negotiate a lease renewal at the same time that you send out your rent increase notice. If you want the tenant to renew the lease, you can reduce the amount of the rent increase. The opposite is true as well; if you want to encourage the tenant not to renew the lease, you can raise the rent amount to a number you feel that they can’t afford or don’t want to pay. This may prevent the need for an eviction later on. Another time you can use the rent increase letter as a negotiating tool is if the lease is scheduled to end during a time when it’s difficult to rent out the property, for example, around the Christmas holidays. Then you can have the tenant renew the lease for a 14-month period or a time that better suits you and in return, you will increase the rent less than you originally planned. A rent increase letter should have certain parts to make it legal, easy to understand, and convey the required information to your tenant without any confusion. However, you can change the wording if you know your tenant and want to include or exclude something specific so as not to upset them. Typically, there are four types of rent increase letters: the annual rent increase notice, the lease renewal rent increase letter, the mid-lease rent increase letter, and the month-to-month rent increase letter. They should all include the same components (e.g., the date of the rent increase), but the dates will vary depending on the type of rent increase letter. 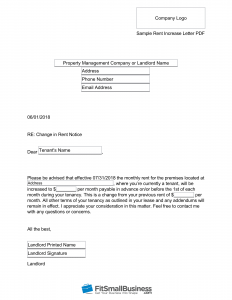 This usually appears at the top of the rent increase notice in the header so the tenant immediately sees who the letter is from and can contact you if they have any questions. The information here should include your or your company’s name, address, phone number, and email address. This is important because this is the date you wrote the letter and you want to allow at least a few days for the letter to arrive in the mail before the notice period begins. For example, if you’re giving a 60-day notice, allow at least 65 days so the letter arrives before the notice period starts. This is the subject of the letter and a pro tip is use “Change in Rent Notice” instead of “Rent Increase Notice” because it doesn’t immediately put the tenant on the defensive. This is where it’s important to be careful with your wording. You can choose another subject, but it should convey the message without being rude. This is another area where the wording matters. Some landlords write “Dear tenant,” but we recommend using the tenant’s first name so it’s informal but still friendly. It identifies the tenant as a person first and then a tenant later on in the letter. This can be written in whatever type of style you feel comfortable with, but it needs to include the date the rent increase will take effect, the property address, and the amount of the current rent. It should also mention that the named person is a tenant at that address and it should mention that all other terms of the tenancy will remain the same. We suggest adding a phrase about thanking the tenant for their cooperation and that they can contact you with any questions. Again, the wording here matters and if those two phrases are included, the tenant is less likely to think of this as a demand and more likely to think of it as an agreement. This is the last part of the rent increase letter and should include your name, signature and your title, such as the landlord, property manager, etc. For more information about what a rent increase letter looks like, check out our four different rent increase letter templates. Choose the one that works best for you and download it to use as a guideline for your own rent increase notice. Before you deliver your rent increase notice, read it over and make sure it sounds professional, friendly, polite, and to the point. A tenant will appreciate correspondence that is polite and not demanding, and keeping a positive landlord relationship is important. Also, check that your rent increase notice gives the proper notice noted in your lease and follows all applicable state landlord tenant laws. It’s best to deliver a rent increase notice and any other correspondence with your tenant via certified mail. This is because the sending and receipt of the letter are recorded so there’s no future confusion between the landlord and tenant on when the rent increase letter was delivered. Basically, a tenant can’t later say that they never received the rent increase notice because there’s proof that they did receive it. Besides certified mail, email is generally an acceptable method of correspondence with your tenant. However, keep in mind that it may be hard to prove that the tenant received and/or opened the email. Different states have different guidelines for email being an acceptable alternative to certified mail, so it’s best to send certified mail in addition to an email. Be sure to check out the landlord tenant laws in your state about landlord tenant correspondence. Check out our helpful guide on landlord tenant laws and a free interactive map of landlord tenant laws in all 50 states. Below, we’re going to answer the most frequently asked questions about a rent increase letter, including how much a landlord typically increases the rent. However, if you have any additional questions or want to comment on the topic, visit our forum. How Much Is a Typical Rent Increase? The rent increase varies, but typically it ranges from 3 percent to 5 percent. You should evaluate your expenses and see how much rent increase you need to cover them and also consider if the tenant can afford it. You don’t necessarily want to lose a good tenant over a small rent increase. 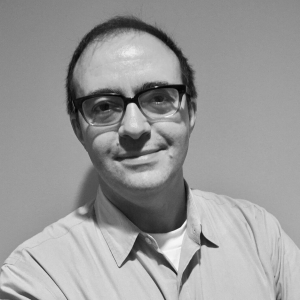 Can I Raise the Rent on My Tenants? You can raise the rent on your tenants, but you have to give them the required notice that’s in your lease and that adheres with the landlord tenant laws in your state. Generally, 60 days’ notice is required before you raise the rent. Can You Raise Rent on a Month-to-Month Lease? Yes, a month-to-month lease is generally the easiest kind of lease to raise the rent on because the tenancy is only guaranteed for one month at a time. Most states require that you give the month-to-month tenant 30 days’ notice in the form of a rent increase notice. At that time, they can stay and pay the additional rent or vacate the premises before the rent increase goes into effect. When Do Landlords Typically Increase Rent? Landlords generally raise the rent when a new tenant moves in or when a tenant’s lease expires and they want to renew it. Raising the rent can help pay for the increased cost of living as inflation rises, including utility bills, property taxes, insurance, etc. However, if a landlord has a good tenant that pays on time, they may not raise the rent to keep the tenant happy because finding a new tenant can be costly and time-consuming. For more tips on being a landlord, read our article on landlord tips from the pros. A rent increase notice notifies a tenant that their rent is going up and by how much and when it will take effect. Generally, there is no rule of thumb as to the amount that the rent can increase, but you do need to adhere to your lease and your landlord tenant laws. The amount of notice required is generally 60 days. If you’re a landlord or property manager that wants easy access to templates, online rent collection, and maintenance requests, contact Avail. They are a nationwide property management software that makes being a landlord or property manager easier. Your first unit is always free.